The recent "Bronze" exhibition at the Royal Academy in London, a sweeping display of works made all over the world during the past 5,000 years, brought together more than 150 of the finest bronzes known to art historians. This remarkably varied array offered a rare opportunity to compare and contrast how artists over the centuries used this metal, known for its malleability. Yet even in this feast for the eyes, a few stellar casts stood out. One was the celebrated Chimera of Arezzo. 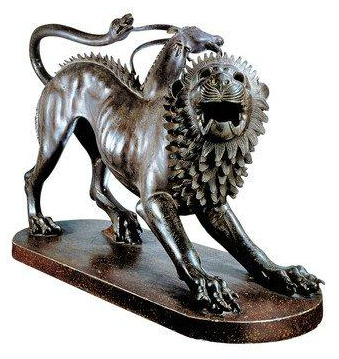 Big and bold and dated to about 400 B.C., the Chimera "is one of the most arresting of all animal sculptures and the supreme masterpiece of Etruscan bronze-casting," wrote David Ekserdjian, the British art historian who organized "Bronze," in the exhibition catalog. New research has recently cast doubt on the age of its one rival for that title, Rome's She-wolf, which is now characterized by the Capitoline Museums, its home, as "fifth century B.C. or medieval." This snarling, fire-snorting Chimera, which has a storied history, epitomizes the mythical monster that figures in many classical Greek texts and was first mentioned, among those that survive, in Homer's "Iliad": it's a dramatic fusion of a lion's head and body, a serpent forming the tail, and a horned, bearded goat's head and neck protruding from the spiked spine of the lion. Remarkably, the artist—or multiple craftsmen, as many scholars believe—who created this frightening concoction managed to make it look menacingly real. Wounded on its left rear rump, the lion howls out in pain, and the goat's head lists to the left, bleeding from the neck in bronze drops of blood. It looks ready to pounce at an attacker. And perhaps it was. According to legend, the chimera prowled the land of Lycia, now in Turkey, terrorizing inhabitants. Lycia's king, Iobates, ordered a young warrior named Bellerophon to slay the chimera as a favor to a neighboring king, Proetus, who wanted Bellerophon dead. But, riding his winged horse, Pegasus, Bellerophon instead emerged victorious from his battle with the beast (winning the hand of Iobates' daughter and eventually his kingdom). Thus art historians believe that the Chimera of Arezzo was originally part of a group sculpture that included Bellerophon and Pegasus. A round hole on the left rear suggests a spot where Bellerophon may have landed a now-missing spear. Yet this piece, which stretches more than 4 feet in length and is the largest surviving representation of the Bellerophon myth, clearly stands on its own. From their base in what is today Tuscany, the Etruscans were active traders who knew and imbibed the artistic traditions and techniques of Egypt, Cyprus and other countries around the eastern Mediterranean rim. As they developed their own art, they leaned toward the Greeks' naturalistic style. Catching the moment when the defiant monster is fighting for its life, the Chimera of Arezzo is a lean and savage beast, nearly starved for food. The skin is taut, revealing ribs and veins in the torso, muscles in the haunch and legs. The eyes have lost the inlays of another unknown material that once were there, but they still glare, heightening the tension created by the creature's aggressive pose. At one time, the lion also had teeth, but they are hardly needed to convey the beast's ferocity. Throughout, the artist cleverly captures varying textures, such as the goat's smooth neck and the lion's hairy mane; details, such as its sharp claws and lined forehead; and, most of all, movement. The last alone distinguishes the Chimera from the more static She-wolf. The artistry bolsters the theory of scholars that the Chimera had a religious purpose. As evidence, they cite the inscription on the beast's right foreleg, which translates as "for Tinia," who sat at the top of the Etruscan pantheon, the equivalent of Zeus and Jupiter. Was the sculpture, as some scholars suggest, commissioned by a wealthy family as an offering? Was it part of a shrine to Tinia? We do not know. When it was discovered in late 1553 near Arezzo, southeast of Florence, along with some smaller bronzes, it was quickly claimed by Cosimo I de' Medici, then the Duke of Florence, later the first Grand Duke of Tuscany, and the founder of the Uffizi. The great goldsmith and sculptor of that era, Benvenuto Cellini, wrote in his autobiography that these finds were covered in "earth and rust." The duke, Cellini continues, "amused his leisure hours by cleaning up these statuettes himself with certain little chisels used by goldsmiths." He also hired Cellini to restore them, including the Chimera, though exactly what remains of his work is unclear. Over the years, other restorers also worked on it. Marks show that the left front and rear paws were reattached; a goat horn was repaired. The tail was missing, and the current serpent was added in the late 18th century, curiously biting the goat's horn—which diverges from other renditions of the chimera and was probably not the original design. Nonetheless, its magnificence was clear from the outset. Giorgio Vasari, the great art arbiter of the Renaissance—who incidentally was born in Arezzo—wrote in the preface to his "Lives of the Artists" that "This figure proves that the art of sculpture had reached perfection among the Tuscans in very early times…. Because of its beauty and antiquity, this work has today been placed by the Lord Duke Cosimo in the hall of the new rooms at his palace," the Palazzo Vecchio. The Chimera eventually moved to the Uffizi, and then again to the National Archaeological Museum of Florence, where it can be seen today, a splendid example of the imaginary turned nearly real.